For the past 14 years German director Christian Petzold has been steadily building up a reputation as a post-renuifciation master, subverting genre plots and tropes into fascinating and haunting meditations on modern (and the largely still fractured) Germany. But with 2012's Barbara, Petzold's most high profile film yet, he went back to the days of the iron curtain to conjure a story of empowerment, sacrifice and defiance. He now looks to be rocketing into the upper echelons of prestigious world cinema with his latest, a Post-WWII set work entitled Phoenix. 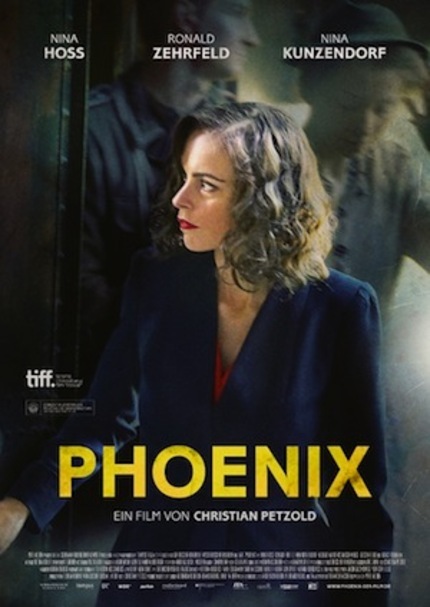 Bowing at Toronto this past week, Petzold's seventh feature film (not counting some fine television work) sees his often muse Nina Hoss as a concentration camp survivor. Undergoing extensive facial surgery for the wounds she received at the hands of the Nazis, Hoss meets up with her husband, played by Ronald Zehrfeld, who doesn't recognize her as his wife (he assumes she is to be dead), but sees the resemblance enough to use her for a scheme he's concocting. While there's been some sure fire buzz out of the fest for mostly Midnight Madness flicks, Phoenix, a more formally quiet film lets say, has been getting raves. And frankly, as someone who is a massive fan of both Petzold and Hoss, this comes as no surprise. What you have here are two finely-tuned and mature artists in the flow, working with collaborators who are just as sharp. The trailer, embedded below, presents a cool, calculating look into post-war Berlin, with gorgeously moody dives and alleys; the city's night life spotlit by gauzy reds and dingy browns, before being swallowed up into a seemingly impenetrable velveteen black.